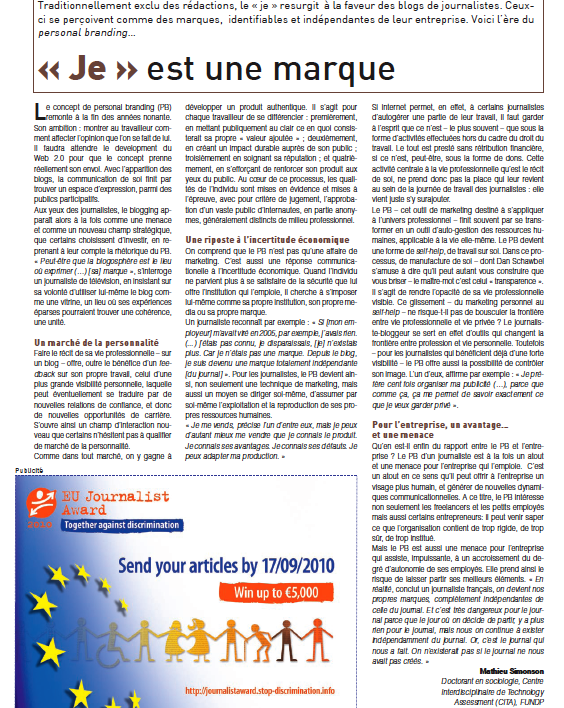 L’article – publié dans le dernier numéro du mensuel Journalistes (n°116, Juin 2010) – se trouve juste ici. In this paper, we will present the Internet as an arena in which social actors can participate, in a new way, to the making of an informed knowledge society. We want to make clear that the present paper does not deal with the Internet (or the Web 2.0) in itself, but rather with the motivations of the Internet users, and more specifically with the motivations of those who decide to use blogs and Content Management Systems (CMS) as journalistic tools. Here, by ‘journalistic tools’, we mean tools designed to collect, write, edit, and present news content to a given audience. In the present paper, we based ourselves on an empirical study that was realized in Belgium between February and December 2009. We worked, more specifically, on the basis of fifty interviews that have been done among francophone political journalists: amateurs and professional journalists, independent and salaried journalists, opinion and mainstream journalists, freelancers and employees etc. These journalists have all been asked one very simple question, which is « How did you start using the Internet as a journalistic tool? ». The responses were manifold. They have been analyzed and then classified in different patterns, that help us shed light upon what we call the “logics of self-publication”. Different motivation patterns – or different groups of aims, so to say – have been identified, on different practical, relational, ideological and economic levels. Here are the results of this analysis of motivations. First, journalists-bloggers are motivated by the aim of exerting a control upon their own labor, and reinforcing their own personal autonomy as journalists. A blog – or any Content Management System – can indeed offer a journalist the opportunity to control his or her own writings, and to develop himself or herself, not just as a journalist, but also – more importantly – as a « brand », independent of the newsroom. Second, journalists-bloggers are interested in improving their own social or professional recognition. In other words, they are pursuing relational advantages through their blogging activities. Blogs and Content Management Systems allow indeed journalists to get in touch with a large variety of small audiences, and engage in horizontal dialogue with the members of these audiences. And, third, journalists are sometimes interested – consciously or not – in affirming their personal viewpoints publically. We classify this in what we call « ideological goals ». Content Management Systems allow indeed journalists to publish articles, and defend ideas or opinions, that they believe could never get published within the realm of traditional media. Blogging does not generate direct economic gains. But it does not mean that these gains are not at least indirectly present in the discourses. Just because economic profit cannot easily be taken as an achievable end of blogging, doesn’t mean that it cannot be one of its possible outcomes, through the improvement of social or professional recognition for instance. 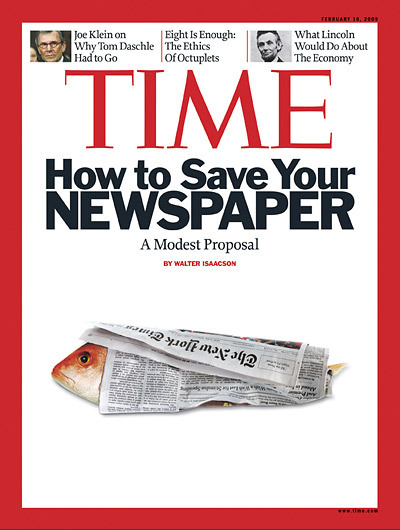 The pursuit of relational goals such as “gaining visibility” or “developing oneself as a personal brand”, can indeed lead a journalist to reinforce his or her own credibility or authority in the media sector, which can be viewed as a source of economic profit. Finally – aside from these practical, relational, ideological and economic motivations – we can identify a few motivations that cannot easily be classified, either because they are undetermined, or because they are formulated in a negative way. An undetermined motivation is a motivation that is not directed towards a pre-established end, like “Experimenting new things” for instance. And, a negative motivation is a motivation that does not directly aim at getting a particular advantage, but rather, at avoiding a particular “evil”. Here is a common example that we can find in the discourses of professional journalists-bloggers: « not to be absent of a phenomenon that I don’t know, and that I dread ». These latter motivations show us that journalists – and professional journalists in particular – consider CMS as a promising technology as well as a dangerous arena. A place fulfilled with personal and social opportunities and but also a place characterized by « manipulations » and « calumny ». It consequently leads them to affirm that Internet platforms, such as blogs, cannot fully develop as authentic democratic platforms unless filters and rules of discussion are imposed upon it. This leads us to a new field of inquiry, which is the ethics of self-publication.